Reports of a new fitness tracker from Samsung first surfaced last month, followed by a leak from the company’s own website. Now, what look like promo images for the new device — thought to be the Gear Fit 2 — have appeared online, showing the wristband with a variety of watch faces and fitness-tracking apps. As we’ve seen from Samsung’s own renders, the Gear Fit 2 looks to have a sleeker profile than its predecessor, with a display that sits flush with the wrist band, rather than raised up from its surface. The screen is reportedly a 1.84-inch Super AMOLED, and the device is rumored to have 4GB of internal memory, built-in GPS (absent from the original Fit), and Samsung’s new Bio-Processor on board. This chip was first unveiled in December 2015 and measures a number of biometrics, including skin temperature, heart rate, heart rhythm, and body fat. Inclusion of these features seems to be supported by this latest leak, but we’ll have to wait until June — when the Gear Fit 2 is rumored to be unveiled — to find out more. 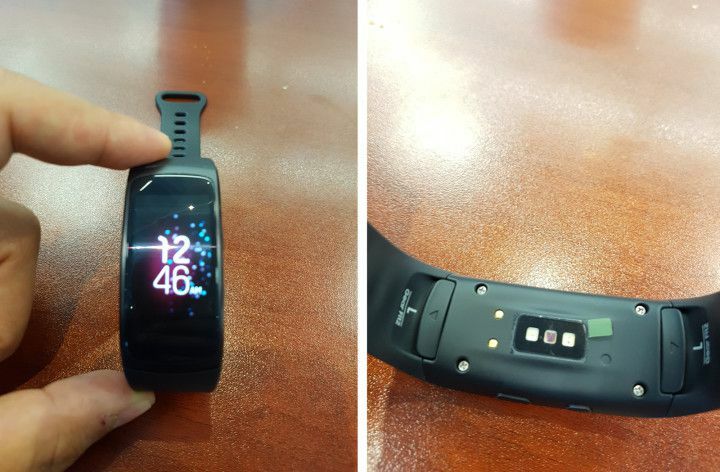 Earlier leaked images of the Gear Fit 2.